Spice your Life: Manoharam - Indian Cooking Challenge for August ~ Step By Step Recipe! Manoharam - Indian Cooking Challenge for August ~ Step By Step Recipe! Before getting into the details of this month's challenge, I would like to thank all my ICC members for getting event cross a year! Its been a year since we are challenging ourselves to try new and varied dishes. Thank you all again. Thanks to Padma for bringing this to my notice. This month's Indian Cooking Challenge was Manoharam. 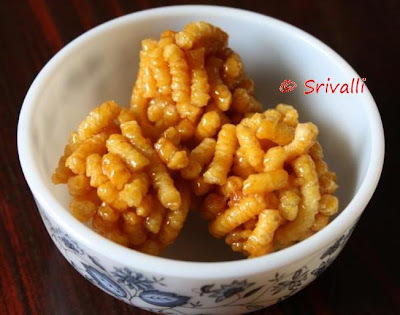 Its a famous snack from Tamil Nadu. 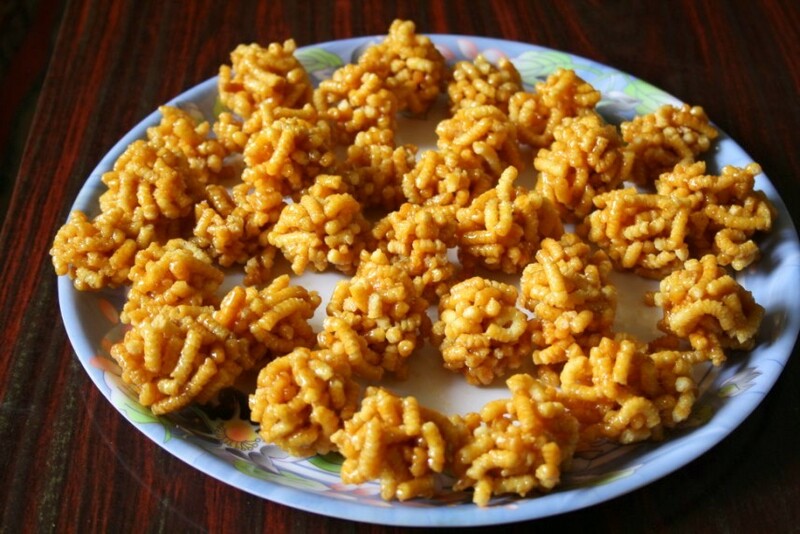 Though it may look like murukus, the final product is quite different. These are murukkus mixed with jaggery like in Chakkli. I once bought it from stores and really enjoyed it. 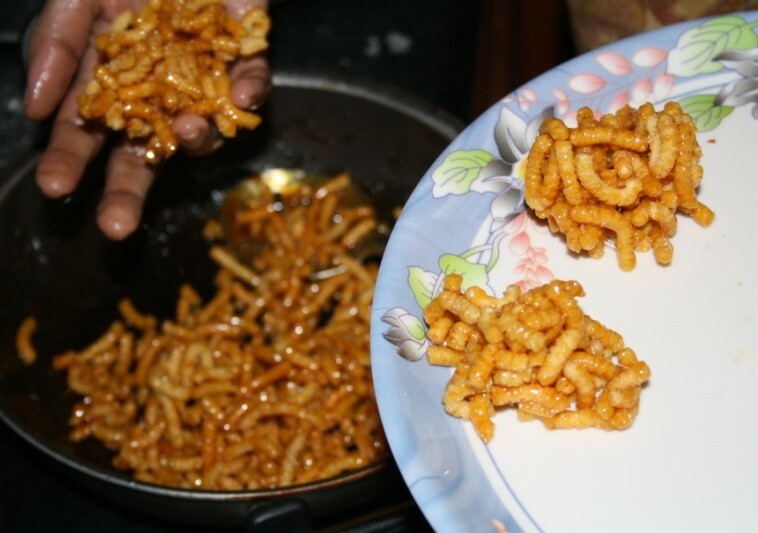 But Amma had never prepared it at home. This came out really well and everybody at home enjoyed it, especially with all of them helping in making this. Since I ended up making it only today, I couldn't do it on my own. But I was glad that Amma and Athamma enjoyed making this. These recipes are from a cookbook authored by S. Meenakshi Ammal Vol 2. 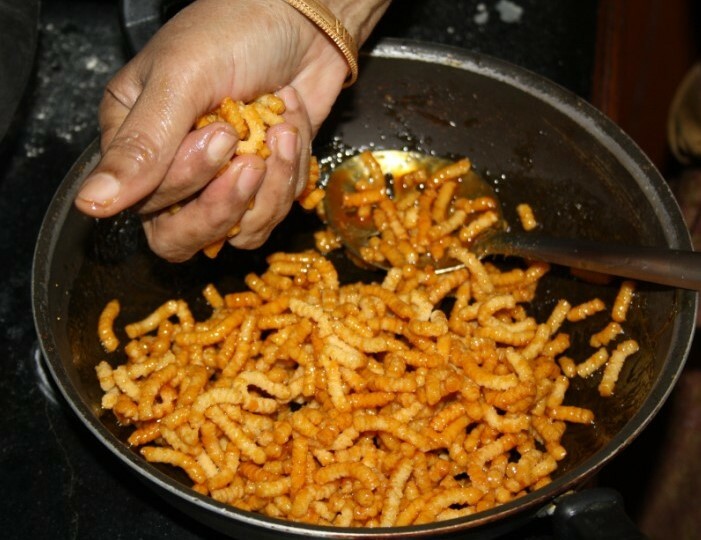 Lataji has been kind enough to share the recipes with us. The recipes are measured in small quantities. As always we are expected to pound our own Rice flour and Urad Dal flour. 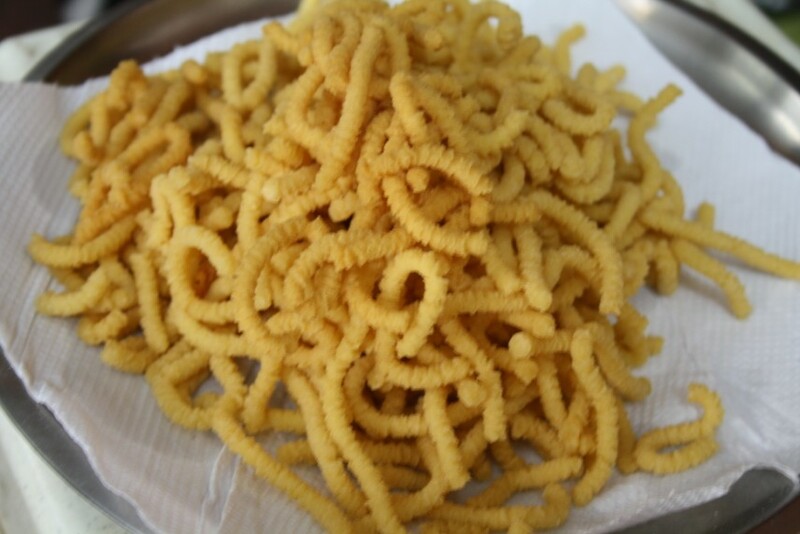 Manoharam ~ Sweet Chakli Balls..
Fry the yellow moong dal. Sieve it to a fine powder. Adding little water, knead to a soft pliable dough. 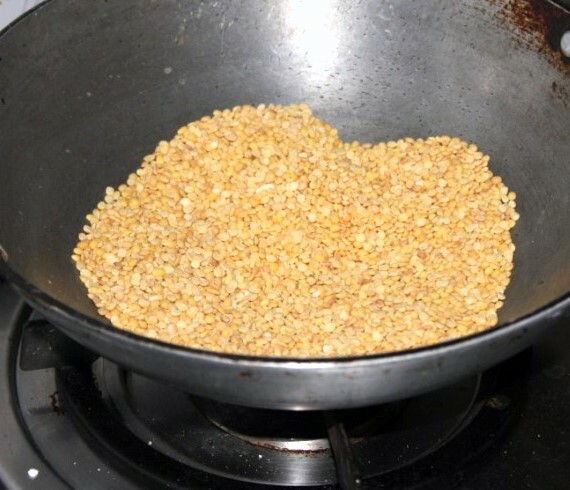 Using a muruku press, press it down once the oil is hot. Drain to a kitchen towel. Meanwhile get the Jaggary powered. The recipe calls for just 1 cup but we had to use 1/2 cup more. Bring to boil and cook till you get the consistency of a ball like this. Once this is ready, immediately add the crushed murukus to the jaggary and mix well. This is when you will really need multiple helping hands..everybody in the family pinched in to help. Careful with the heat though. Press it down as a ball. Allow it to cool down further. Gadget: Murukku press with the three dot pore disc fitted in. 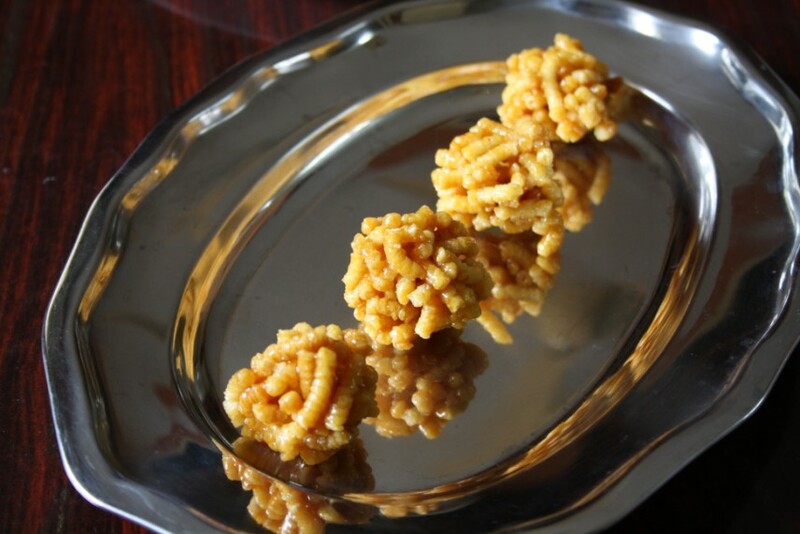 4 measures in volume (As in cups) of murukku bits to 1 heaped measure of powdered jaggery would work fine. Wash and soak the rice for 15 mins. 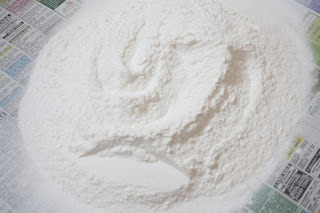 Drain and spread over a clean cloth to absorb excess moisture. You can shade dry the rice for 30 - 40 mins. Grind the rice to a very fine powder. We couldn't use the dal raw, so dry roasted it. (recipe calls it to be used raw) then grind it until very fine too. 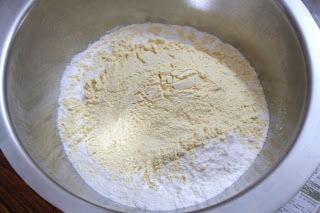 Measure two parts of rice flour against one part of moong dal flour. 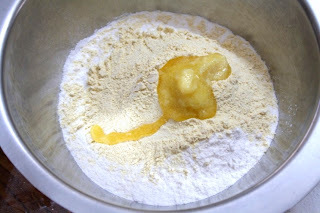 Mix well and add some salt to the mixture. 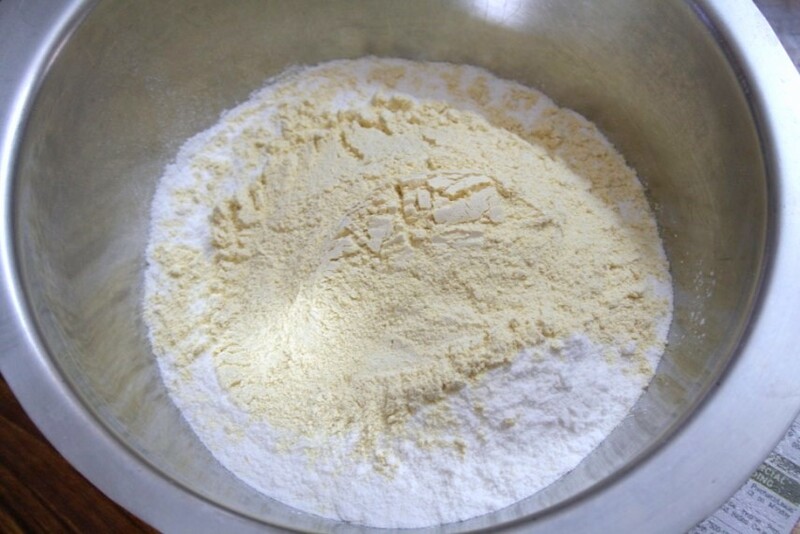 Rub in the ghee to incorporate it well with the flours. 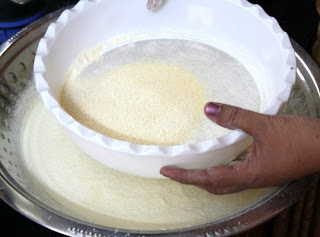 Add water and knead to a dough that can be passed through the pores of the murukku press. 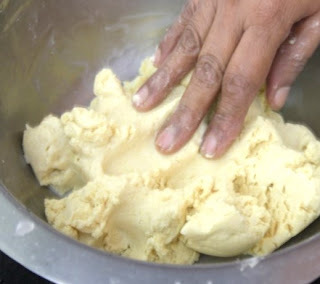 If you are making more than the mentioned measure, prepare the dough in batches, otherwise the murukkus become discoloured due to exposure to air. 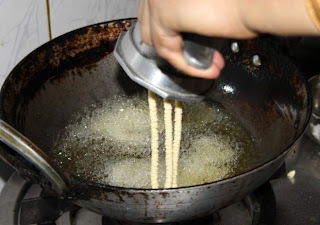 Heat oil in a pan and on a moderately hot temperature press the murukkus in the oil and fry them until they are crisp. Remove with a slotted ladle and place on absorbent tissues to remove excess oil. Once cool, break the prepared murukkus in tiny bits. Measure this by volume and the powdered jaggery. Take the jageery in a pan and add some warm water to it. 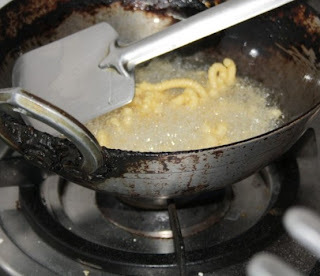 Stir to dissolve and pass through a strainer to remove scum. Place the dissolved jaggery in a pan and bring to a boil. Boil this down to a syrup of a rollable hard ball consistency. You may drop few drops of syrup in cold water and roll the syrup with your fingers to form a ball. Lift the ball off the water and drop it back into the water with force. You should be able to hear the sound of ball hitting the floor of the cup. This is the correct consistency. Remove the syrup from the fire. Quickly add the bits of murukku and give a brisk stir in order that the jaggery syrup coats evenly on the pieces. While still warm and the heat is of manageable warmth, Grease your palms lightly and roll the mixture in balls just about bigger than ping-pong balls in size. Place them separately on a flat dish. Serve as such. Optionally you may cut slices of coconut and add them to the jaggery and murukku mix prior to making the manohara urundais. Wash, soak, drain and pound the rice to a fine powder. Powder both dals raw to a very fine powder. (Sun drying the dals prior to pounding makes the process a bit quick). Mix the pounded dals together. 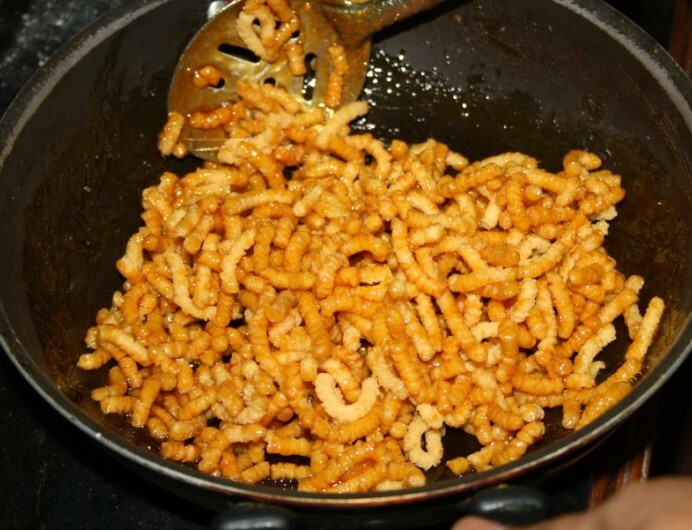 Measure equal volume of dalcarb and with water mix to a batter of boondhi consistency. Heat oil. Hold the ladle just over the pan and rub the prepared batter to drop as boondhis into the oil. Deep fry them until done. 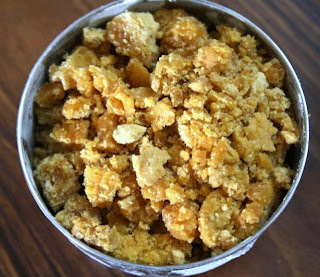 For four parts of this boondhi, measure out 1 part of powdered jaggery. 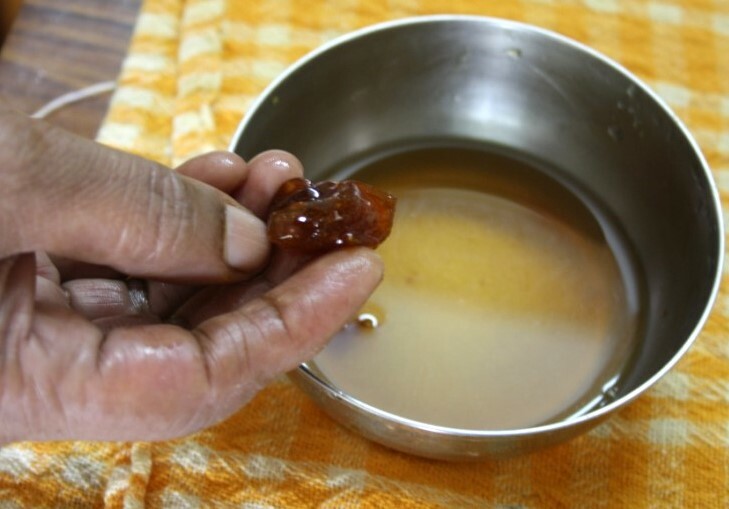 Dissolve jaggery in water and strain the scum out. 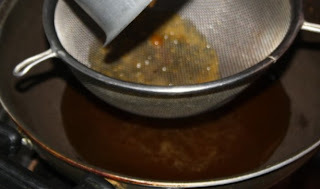 Bring the jaggery to a boil and allow to boil and form a hard ball syrup. 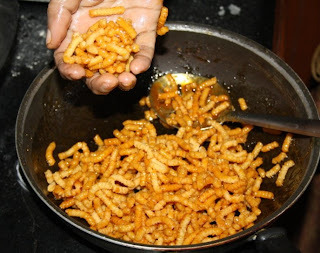 Remove from fire and mix the boondhi to the jaggery. When the heat is warm enough to handle, make balls of the mix with hands. Place them apart on a flat plate until ready to serve. If in both recipes someone wants sweeter manoharams just about one tablespoon will enhance the sweet. To all my ICC members, please link your Manoharam post to Mr. Linky.